Review Board can integrate with Mattermost to post notifications whenever review requests or reviews are published. You can have multiple different Mattermost configurations to deliver notifications to different channels (or even different Mattermost instances). Click Add a new configuration for Mattermost on the Integrations page in the Administration UI. Select the conditions under which Review Board will send notifications to Mattermost under this configuration. If you have a small Review Board server and want all notifications to go to the same place, you can set this to Always match. However, you can also create complex rules to match based on repository, groups, or other criteria. Register a new Incoming WebHook on Mattermost. 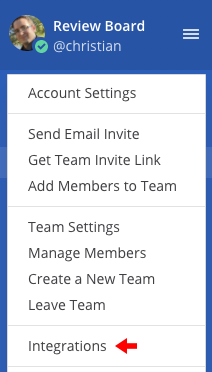 To do this, open the Main Menu in Mattermost and click Integrations. Then click Incoming Webhook -> Add Incoming Webhook. Provide a title and description of your choosing, and then select the channel you want to post updates to and click Save. This will create your Incoming WebHook. Copy the URL it generates and paste that in the matching field for your configuration on Review Board. If you want to reuse the same WebHook URL for multiple channels on the same Mattermost team, you can. Just provide the same URL you used in another integration and then set the Send to Channel field to your desired channel.